Bettie Page Clothing has landed in NY! Boy oh boy am I excited! 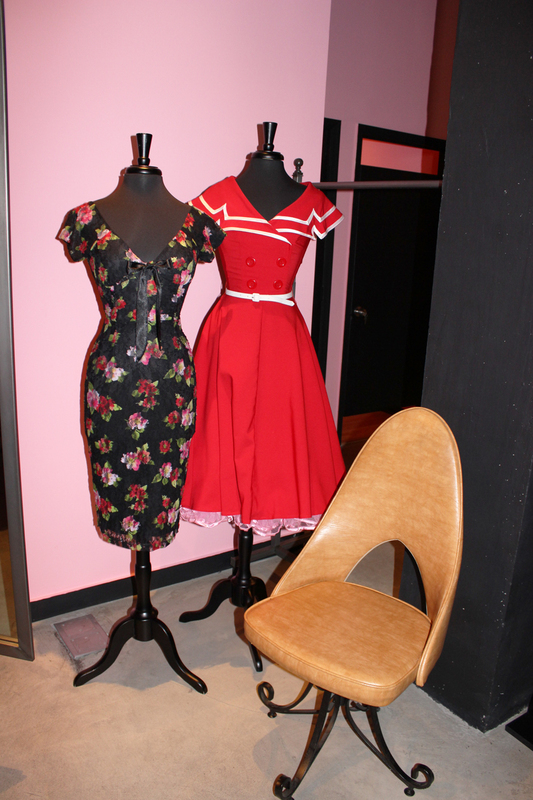 We now have our very own Bettie Page Clothing store here in NY! Now I don’t have to travel far out to the west coast just to experience this amazing shop of rockabilly greatness. I was so thrilled to hear the news as I am always contemplating moving out west to be closer to the rockabilly culture. But with the Bettie Page store here, NY feels even more like home. The culture is spreading and inspiring women to dig deeper into this mid-century phenomenon and I am loving every minute of it. It is great to see women embracing their femininity in pencil skirts, back seams, sun dresses, cat eyes, and classic Hollywood hair do’s. So how do you channel your inner pin-up girl? The Bettie Page Clothing store has everything you need. They have such a great selection of vintage inspired dresses and separates, children’s clothes, accessories, and books on vintage makeup and hair styling. What more could you ask for?! I was so impressed with their selection of dresses, the fit and feel was great. My friend Priscilla and I had a field day of torture trying on everything in the shop. The staff made it an even better experience as they were incredibly helpful and sweet. I also really love their adorable kids line. 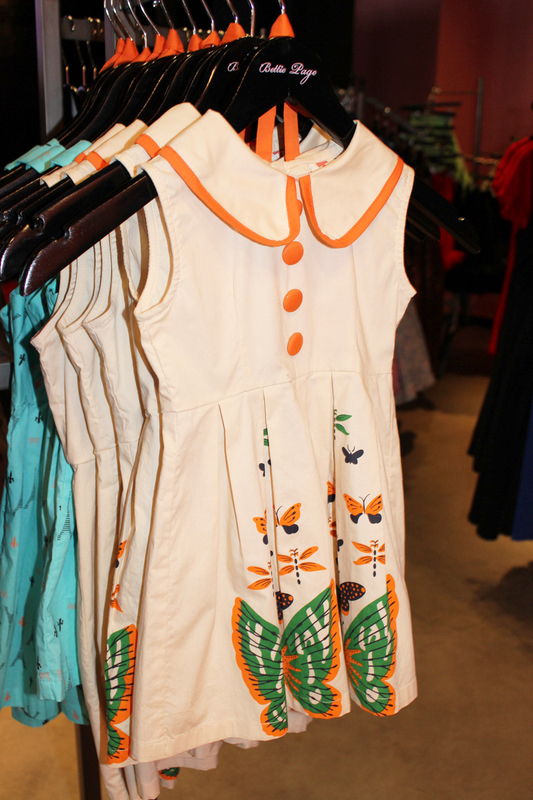 I haven’t seen any company recreate mid-century kids clothing. It is really cute that a mother and daughter can wear matching dresses! They even sell cute collars for pups! You dolls have to pay this shop a visit, but if you can’t here is a tour of what you can expect! 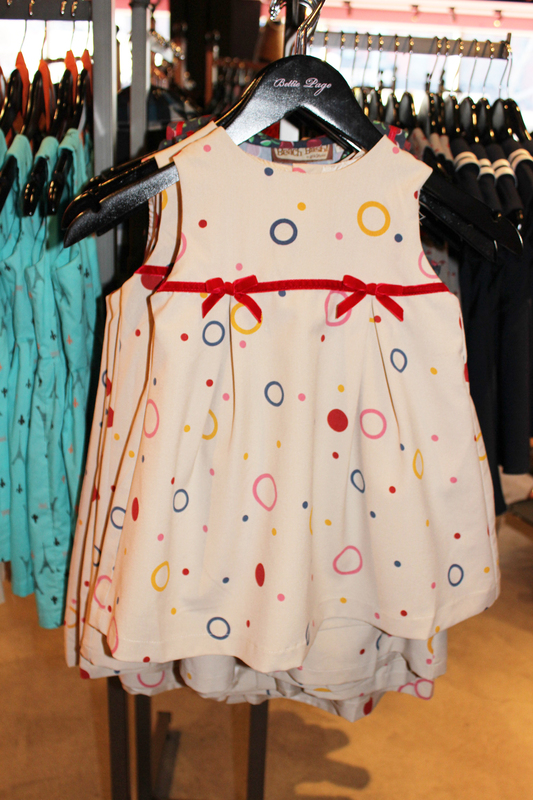 The inside of the shop is super cute and the mannequins are styled perfectly in BPC dresses and separates! I love these floor decals of old vintage ads! The shop is pretty big and stocked full of greatness! If you need jewelry to finish off your retro look, they have got you covered! Love the window displays! I can’t wait to show you dolls my next post. I tried on this dress and it looks and fits amazing! Stay tuned for Fitting Room Confessionals: Bettie Page Style! BPC recently launched their new fragrance and it smells yummy! Also, notice the bakelite bangles and the cute puppy collars! Heaven! Oh Bettie ❤ This fuzzy Beverly dress fits AMAZING and is so comfortable. I tried it on and didn’t want to take it off! I have this dress in a pencil cut version and I love it! I was so happy when I saw these vintage leucite inspired pumps by BPC! I also tried on this Iced Coffee dress and it was one of my favvvorites. The color seems tough but looks so great on! I own so many different colorways and styles of this dress, I don’t know what to do with myself. It’s just perfect. Priscilla loved this dress! The books they sell at the BPC store are so incredibly informative. I learned so much from these books! The hangar does the Nancy dress no justice. This dress looks AMAZING on and fit me the best! Can’t wait to show you all in my next post! Another Captain classic! This gingham romper is sooo CUTE and even has pockets! 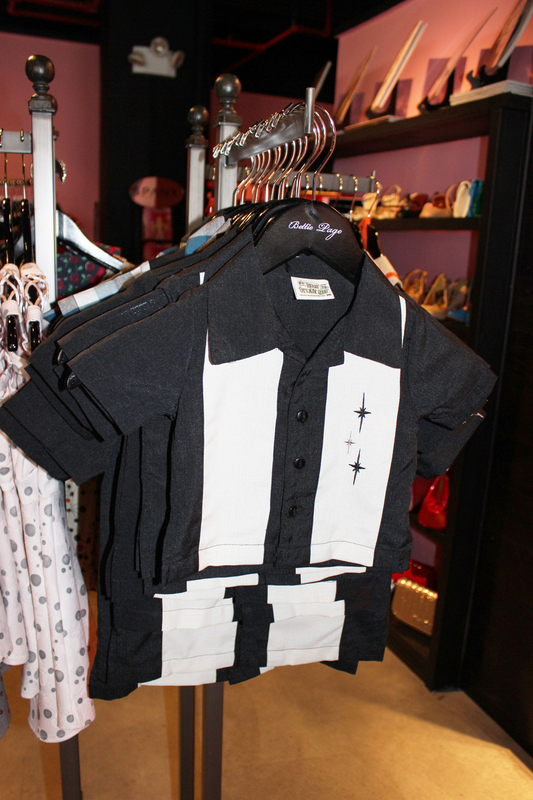 Look at the adorable selection of kids clothes! You can’t help but love a lady in leopard! I love all of the Olivia De Berardinis art you can find at BPC. She is one of my favorite artists and her paintings of Bettie Page reigns supreme! I feel fortunate to have all three of these Olivia books signed by the artist herself! Turns out, she’s a native New Yorker! Shake your stuff Tempest Storm! So pretty! Need a purse and shoes to accessorize your look? Look no more! 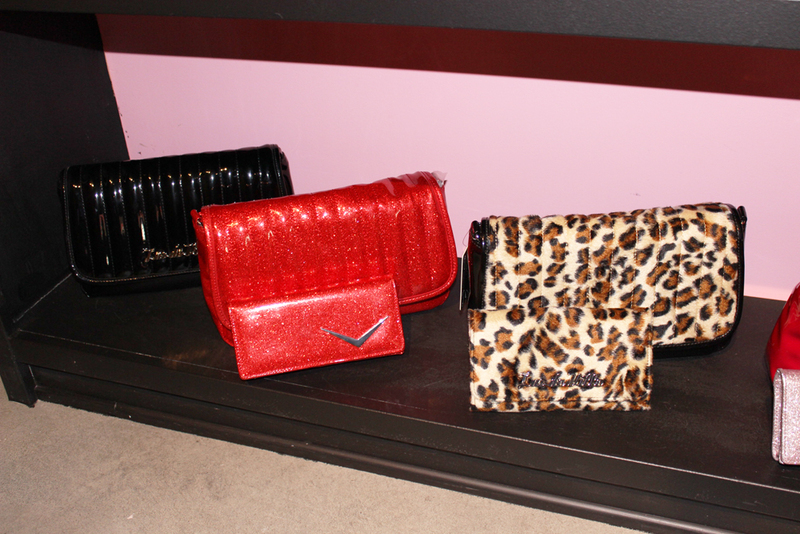 Lux De Ville purses! Bettie Page shoes! They are so comfy! Priscilla tried on the Bettie Page circle skirts and loved the length and fit! Peek a boo! Tres Noir makes some of the best vintage reproduction sunglasses and you can now find them at the BPC store! I made sure I dressed the part for my day of exploring the new BPC shop with my gal pals 😉 I was drenched in vintage aside from my Zara wedge boots<3 That is all folks! Can’t wait to show you what Priscilla and I tried on at the shop in my new Fitting Room Confessionals post! I also can’t wait to show you what Bettie Page Clothing has in store for NYFW! Grab your cat-eyes ladies, it’s about to be one hell of a blast of the past! Visit the Bettie Page Clothing store at 303 Bowery here in New York! ← ASOS Fashion Up Mobile App! If I am ever in NY I will be sure to visit! What a beautiful shop. I love that pink embroidered halter dress. I LOVE IT! I felt like I was there with you 😛 hurry up with post 2. Its great to have this store in NYC. I remember when we went to Vegas, you always said “I wish they would open a store in NY”. They have such lovely dresses and the store looks amazing. Congratulations to Tatyana on the opening of her new store. I know! So exciting! I like that the NY one is a hop, skip, and jump away from me though. I still have to visit the Philly shop! I can’t wait to visit NYC to take a peek in this shop, I never expected I’d have a chance saying as they’re all in the West Coast. Next stop – Open in Toronto! I love the fur collar you’re wearing, is it a separate piece? Thank you so much for this beautiful feature. We absolutely adore your blog and look forward to reading the next one! Love this store. Great job. any idea about the size range? those dresses are to die for! My fiancé bought me my first 50’s inspired dress for my 40th birthday at this fabulous store. I must say the set up is great and the service even better. As we fumbled through the dresses Tina our lovely sales associate set me up with a dressing room. She made me feel really comfortable. I tried a dress I loved but it was to small and Tina was able to find the dress I wanted in my size 2x which was in the back. The dresses are so comfortable and feel great on the body. My favorite part was they had a sample pair of shoes for you to try on inside of the dressing room. This helped sell the dress giving me the full feel of 50’s Glam. My fiancé has promised to buy me another dress so thanks Tina and Bettie Page for having such a great store.